I went to Grassway Farms just the other side of Lake Winnebago from Oshkosh, Wisconsin on what must have been the coldest day ever on planet earth. It was a chemistry lesson from some hearty people who have a raw milk farm. After I got back to LA I started drinking raw milk because the stuff I learned about what’s going on with milk and cows was not something I could easily forget. Raw milk is simply milk that has not been processed through pasteurization or homogenization. Back in the day, before many current diseases were commonplace, say around 1920, Americans could buy street legal fresh raw whole milk. Today’s processed milk comes from animals working overtime to overproduce three times as much as the normal cow. Pumped full of antibiotics and manufactured food, the super Holstein slave to the commercial milk machine is a complicated mother. Even if she’s not ingesting Bovine Growth Hormone, today’s hopped up heifer is maxed out. There is, of course, an alternative. Lake Winnebago is frozen over. It’s 8 degrees above zero. There’s a foot of snow on the ground and more falling fast. I decided to forgo the shortcut and drive the icy lake road from Oshkosh to the Grassway Farm in New Holstein. 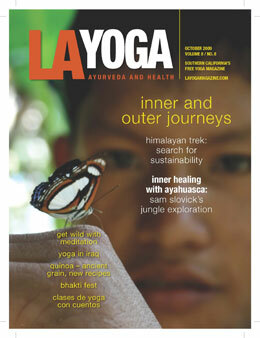 Sam Slovick is a regular contributor to LA YOGA Ayurveda and Health.